For solar energy scientists - especially solar energy architects, Mediterranean and Middle East energy conversion scientists. Introduction (A. Sayigh). Thermal Comfort and the Development of Bioclimatic Concept in Building Design. Introduction. Thermal comfort. Degree day method for estimating heating and cooling requirements for Qatar. Building bioclimatic charts. Problems impairing the use of the bioclimatic charts. Mahony tables. Conclusions. References (A. Sayigh, A. Hamid Marafia). Vernacular and Contemporary Buildings in Qatar. Introduction. Vernacular architecture. Contemporary buildings in Qatar. Conclusions. References (A. Sayigh, A. Hamid Marafia). 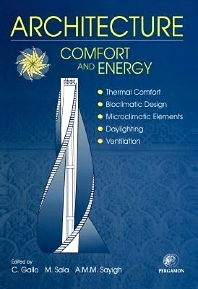 Principles of Thermal Comfort. Introduction. Heat exchanges man-environment. Comfort indices. The adaptation model. Appendix - A. Appendix - B. References. (F.M. Butera). Bioclimatism in Vernacular Architecture. Vernacular architecture vs representative architecture: the role of energy. General principles of the relationship between form and climate. The richness of vernacular architecture. A singular solution - changes of location. Typologies depending on the climate (H. Coch). The Utilization of Microclimate Elements. Introduction. The wind. The sun. Thermal mass. Open public spaces. Shading devices. References (C. Gallo). Daylighting. On natural lighting. Basic physical principles. The physiology of vision. Daylighting in architecture. Daylighting improvement in buildings. Conditions of the sky. Daylighting evaluation in architecture (R. Serra). Ventilation. Introduction. Indoor pollutants. Ventilation strategies. Air flow principles. Building air leakage and natural ventilation. Solar-induced ventilation. Mechanical ventilation. References (H.B. Awbi). Technology for Modern Architecture. Ventilated roofs. Active curtain wall. Greenhouses. Movable shading devices. Light ducts. Integrated ventilation. Cooling technology. Outdoor spaces. References (M. Sala).